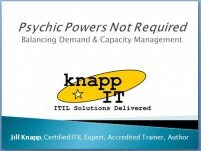 ITIL 2011 Foundation LiveLessons « Knapp I.T. 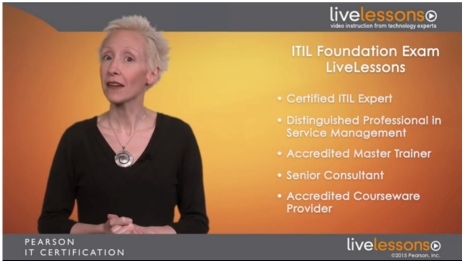 This video product contains over 16 hours of streaming lessons which explain the most popular ITIL Foundation exam topics, in an easy to understand and engaging way. The closest you can get to having me in the classroom teaching you live and in-person is the one-two punch of watching these videos and using the accompanying workbook (sold separately; use the marketplace link below). These videos capture my training schpiel as if I was in a classroom (whiteboards and all! ), and the workbook sold below is almost the same exact one my students get in my classes… over 400 pages of ITIL goodness, containing all of the presentation slides (plus lots of bonus slides to cover the new 2016 material! ), copious notes under each slide giving even more information than what’s said in the videos, plus two full sample exams, and still even more sample questions peppered throughout the material. You’ll have so much practice taking the exam questions, learning how to pick them apart and jump to the correct answer. I want you to pass your exam, and I give you the tools you need to knock it out of the park! If you bought my previous (now outdated!) VideoMentor product from 2009 called (ITIL V3 Foundation Exam Video Mentor), you’ll remember that it was a combo book + DVD set, but this new ITIL Foundation LiveLessons product is consists of videos ONLY. The videos give you everything you need, but they require you to pause the videos and take notes by hand (or screen shots), and that’s annoying. So I strongly encourage you to consider using some of the printed material below, in addition to watching the videos. Check out the supplemental goodies I have for you below; some are for purchase, and there are some freebies too. The Official ITIL Sample Exam A, along with the answer key and Answer Rationales – Published by AXELOS (the official ITIL accreditor) in 2013. Again, all four versions of the Study Guides above have the same exact information; they are just formatted differently so you can choose the option that is right for your eyeballs, budget, and study needs. Whichever one you choose, it’s super-efficient and your fastest way to cram for the exam! PSST! LOOKING FOR ELECTRONIC COPIES OF THE STUFF ABOVE? Many of you have asked me if the items above are available electronically, as opposed to having them printed and shipped to you. The answer is YES, I can get you an electronic copy! How? Just shoot me an email (materials at knapp-it dot com) telling me which item(s) and version(s) you want (color? black and white? highlighted? If you’re ordering a Study Guide do you want the 6 or 10 page version? ), and within one business day I’ll email you an invoice that you can pay securely with a credit card. As soon as you pay the invoice, I’ll generate a watermarked copy of the file(s) just for you and I’ll email it right away. Easy peasy! The prices will be the same as they are if you printed them, except you don’t pay shipping! (Oh, and if you’re buying the workbook, I’ll send you the color version automatically, but I’ll only charge you for the black-and-white.) Save time and money! I hope these items are helpful for you! Thank you so much for your support, patience, and kind words. I worked so hard to create these products for you and am beyond excited they’re finally available to you. When you consider that most ITIL Foundation courses cost upwards of $1000/student, you’re getting quite the bargain by purchasing the videos plus a workbook and a Study Guide. Those three things together give you everything my classroom students get when they book an in-person class with me… except this way, you have the luxury of working at your own pace. Fantastic! So– go get ’em, Champ! And best of luck on your ITIL journey! Jill, I really enjoyed your videos but taking so many screenshots was too much. I purchased your workbook and it saved me so much time, but also provided so much more information and I have a much clearer picture. Thanks to you! –Rohit P.
Thank you for making that 6-page ‘exam-cram’ study guide!!! It is worth every penny like you said!!!! I passed my exam with a 90% thanks to you!!! — Steve D.
Jill you are a wonderful instructor and a gifted writer. i thank you very much for the workbook. I bought the color version (my eyes aren’t what they used to be lol) and it was worth the extra money. the tabs are helpful and the two sample exams are also very nice to have. i took my exam on November 14th via webcam and got 37 out of 40! i wish i knew for sure what three i got wrong, but i think i know. thank you again Jill. — Dorinda B. The workbook / manual made it feel like I was in the classroom with you. I could follow along very easily, all of the slides matched perfectly, and It was very good to have all of the notes and explanations underneath the slides. I am not sure why the workbook isn’t included in with the videos just like your old ITIL V3 was a book plus a dvd. [Jill adds: My publisher did not want to provide a book, even though I told them it was really important that you all have something to follow along with. When they told me I could create and sell my own, I did!] I am very happy with the videos and also with the workbook/manual. Thank you for creating it even though your publisher didn’t want you too. You clearly had your student’s best interests in mind and it shows. I’ll let you know how I do on my exam in December! –Craig V.